Symbolism in “The Devil and Tom Walker” will help you teach financial literacy to your students. Use this lesson plan to teach young adults how to obtain and hold onto wealth. Teaching “The Devil and Tom Walker” and financial literacy covers the following ELA common core standards for reading and writing. In Washington Irving’s “The Devil and Tom Walker,” the devil offers Tom Walker great sums of money in exchange for “certain conditions,” one being the opening of a broker’s office in Boston where Tom lends money at exorbitant rates and unfair terms. Students enjoy the story, yet consider the premise nonsense, until I show them examples of unethical and predatory lenders, unscrupulous usurers, and a multitude of businesses who thrive on consumer debt; in other words, I teach financial literacy by uncovering modern day Tom Walkers and the conditions that allow such characters to thrive. The story is best taught over several class periods, allowing enough time to explain financial concepts, and to incorporate activities. Although there is a lot more symbolism in the Devil and Tom Walker than the symbols I’ve listed here, these should be enough to get started. Tom Walker as an evil broker: Loan officers who dupe people into bad loans, cars they can’t afford, and consumer credit cards with unreasonable terms; predatory lending institutions; unscrupulous credit card marketers. This “meager, miserly fellow” one day takes a shortcut through the swamp and discovers buried pirate treasure over which the devil presides. Walker must use the treasure to open up a broker’s shop, catering to those “driven to raise money by desperate means and desperate sacrifices,” at 4% monthly interest. The more distressed the applicant, the more harsh the terms. By foreclosing on farms and homes, Tom becomes a rich and mighty man, yet lives his life in fear that the Devil will show up and exact payment. Here’s part 2 and part 3. 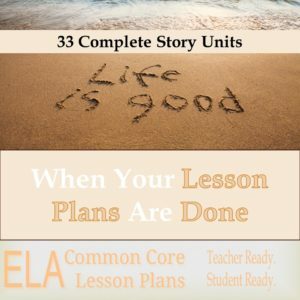 Teaching the Reading Literature Common Core Standards are easy with short stories. Discussion Questions Focusing on Themes in “Cask of Amontillado” by Edgar Allan Poe.